Yesterday, I calculated the “Tornado Capital of USA” to be Diggins, MO, based on the average latitude and longitude of all tornadoes between 1950 to 2017. This got some attention on Twitter and one comment I got was if I could make the same calculation but grouped by year instead so here you go! 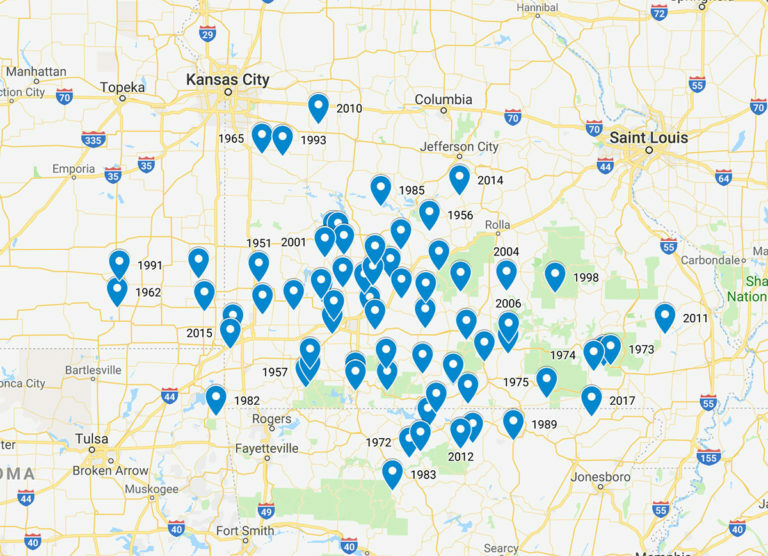 The map can also be viewed directly on Google Maps.It is interesting to see that almost all “Tornado Center” is in Missouri although there are a few in Arkansas, four in Kansas and one in Oklahoma (1982). It is also noteworthy that the Tornado Center of 2007 (year of the Greensburg EF-5) is in Joplin (EF-5 2011). If there is any other map like this you would like to see, let me know in the comments! The data comes from SPC. Tornadoes in Hawaii, Puerto Rico and Alaska were removed from the data. All rows with zero values on latitude/longitude have been removed. The data is based upon the starting coordinates of the tornado.